Well, first we need steering, and that starts with a rudder. 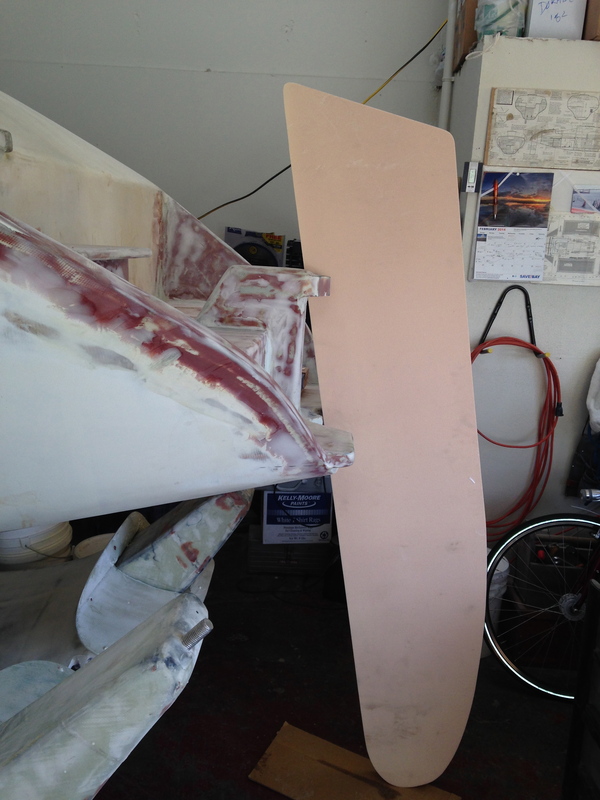 The thickest section of the rudder is 2 1/4″, so we bought full sheets of 1″ and 1 1/4″ foam core. This is more than enough for two rudders, so we’ll cut out materials for a second rudder along the way of building the primary. This occurred to me while attending the Singlehanded Sailing Society lecture on emergency steering requirements for the TransPac race to Hawaii; gotta have a backup steering plan for offshore races, and most boats depart with emergency rudders that put the boat in to ‘limp home’ mode, meaning they are smaller and usually weaker than the main rudder. But we can make a second rudder that can do the dual duty of replacing the damaged first rudder in the original cassette, or being partially inserted into a backup cassette. Need to think more about that backup – with only a few F39s sailing, I’m not aware of anyone having worked this out yet. Work started with big thanks to shop-neighbor Michael Metela Woodworking for the 16 3/4″ rips on his perfect-straight huge table saw. 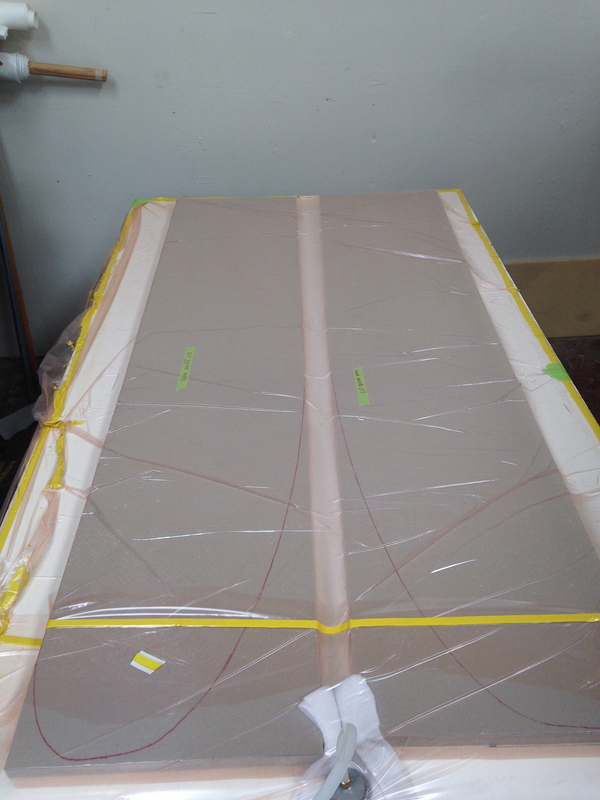 Then we glued and vacuumed the panels together for two 2 1/4″ rudder cores. One piece was set aside for working after the boat is launched, and the primary was cut out roughly with a jigsaw and shur-formed to the right shape. This thing is BIG – about six and a half feet tall. In this photo, note that it will ride about a foot and half lower than the floor height allows here. It will also be angled so the bottom tip leans forward of the pivot pins, helping to balance out the helm feel. 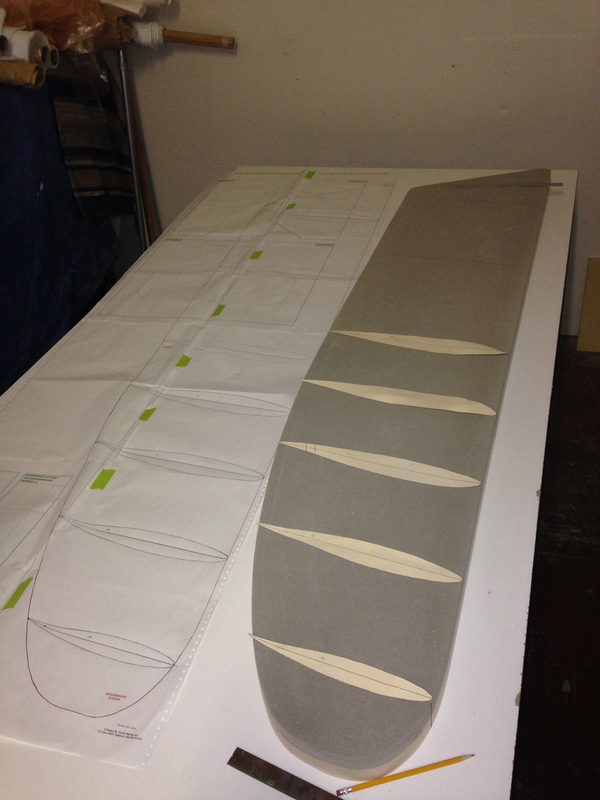 Tonight will drift off to sleep thinking about how best to start the shaping of the rudder core. That began with making the profile shape templates, copied from the plans. The manilla pieces will be traced on to wood (MDF probably) and made in to female shaping guides. Gross amounts of the foam will be removed with the Makita power planer (hand held), then the fine work with the shur-foam and sander. Figuring here it’s best to shape the whole thing, then go back and cut out the sections that need to be replaced with the high density foam inserts. You’ll see that developing in the next post. 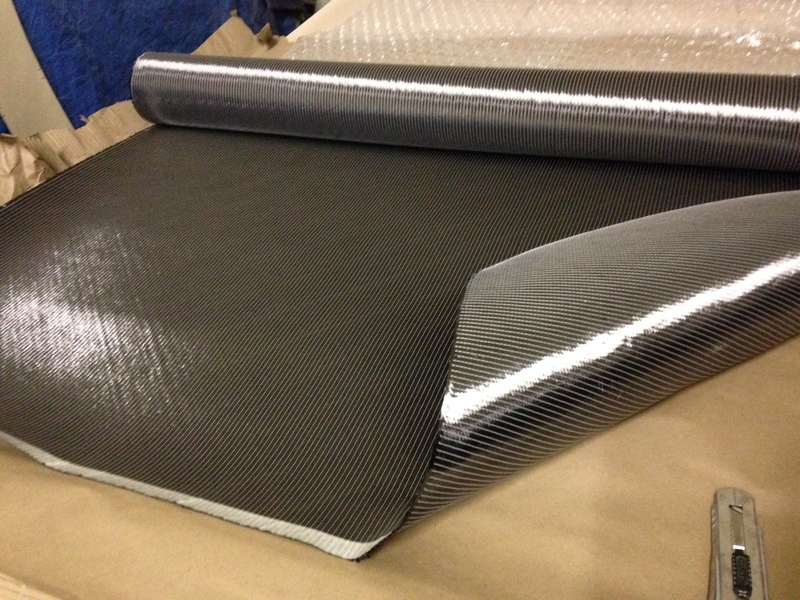 There are a number of steps before wrapping the rudder in its finish fabric, but it was quite luxurious to open up the carbon fiber double-bias fabric today. Spun black gold was the first impression (which coincides with the credit card bill). Pretty stuff, but as an ocean going boat, this beautiful material will get covered up under high quality paint. Oh well.